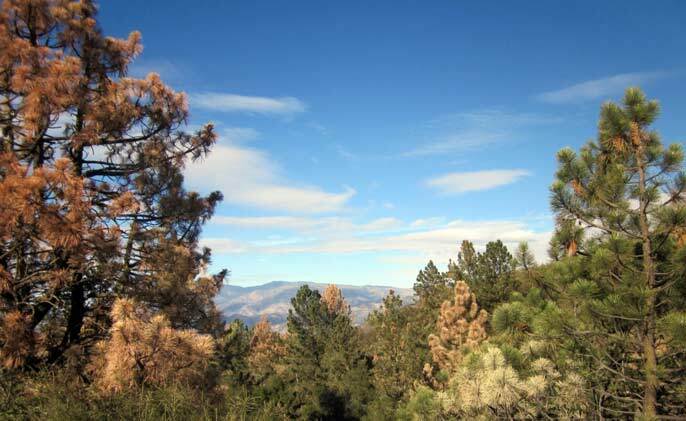 Dying pine trees are visible in this photograph, taken off of Camino Cielo Road in Santa Barbara. California being in the clutches of drought — as it is today — is nothing new. From prehistoric droughts to so-called “megadroughts” that strangled the state some 1,000 years ago, to more recent extreme dry periods in the late ’70s and early ’90s, drought happens. This time around, however, California has more than 38 million residents with water needs and is grappling with a troubling trend that’s in play around the world: global warming. Along the makeshift path heading toward the bluffs at Coal Oil Point off the Santa Barbara coast, dirt grates underfoot; pale withering grasses crunch and crumble. In the nearby foothills east of town, the chaparral is behaving as if it’s summertime and some trees are starting to die. The oceanfront reserve is home to one of five climate monitoring stations run by UC Santa Barbara's geography department to measure temperature, wind speed, precipitation, fog and soil moisture as a means of studying climate change. These days they’re also providing insight into drought. Two of those other sites are in the Santa Barbara foothills, in the same vicinity where Carla D’Antonio, environmental studies department chair and professor, is engaged in an ongoing study of chaparral. Aiming to gauge the plants’ response to dry conditions over time, D’Antonio found that the current drought provided an unexpected but scientifically serendipitous opportunity to also test their survival skills. “Lots of chaparral plants are already adapted to pretty harsh conditions,” said D’Antonio, who is also a professor of ecology, evolution and marine biology. “It just so happens we are now following them through a very intense drought. The plants are very, very stressed. We’re also seeing a lot of mortality of trees. Coast live oak trees are dying. A lot of manzanitas are dying on some of the slopes above Santa Barbara. I think we really need, as a region, to be thinking about the potential for catastrophic wildfire. Fire season is now, still; we’re no longer having a temporal escape from fire season. Similar concerns are emerging across California, where the governor has declared a drought emergency and characterized the protracted dry spell as the worst, statistically, since the state started keeping rainfall records in 1895. Blame Mother Nature, who has essentially erected a roof over the entire state — and parts of the Pacific Northwest — by way of a high-pressure system that is deflecting would-be storms to Alaska and beyond. The same blocking ridge is responsible for the extreme cold, the so-called Polar Vortex, still plaguing parts east. And it’s not just California, or the western U.S. In fact, it’s not just North America. Parts of South America, South Africa and Australia are all in the midst of droughts of their own, seeing essential crops decimated, pastures drying up and livestock dying. “It’s something we should get used to,” concurred climatologist Joel Michaelsen, a professor of geography who used tree-ring records to study precipitation in Santa Barbara and Ventura counties. “Drought operates on a time scale that allows us to forget — over 20 to 30 years. Then it hits and people say, ‘My gosh, I wasn’t expecting this.’ You should have been. We should have been. As stores of water in the West are reduced — whether by usage in drought, evapotranspiration in heat or both — warming temperatures also see the snowpack on the wane. The two phenomena together could put extreme strain on water supplies, which holds implications for ecosystems, industries and people alike. Even at their most severe, the droughts of decades and centuries past did not occur in tandem with today’s degree of temperature change or have to contend with the demands of a population that in California alone now numbers above 38 million residents. As needs for water grow ever greater, so too do the potential threats to its supply. “It’s not just the low precipitation but also vulnerability and demand,” said NCEAS’ Davis, who is also a professor of ecology and conservation planning at UC Santa Barbara's Bren School of Environmental Science & Management. “There are more people living in the wildland-urban zone in California. There are more opportunities for ignitions to occur and more people vulnerable to fires when they do occur. And drought makes fires, once started, harder to control. All these things compound the impact of drought.